INTRODUCING .... the S5-PVAR Stubby model in Caliber 5.56 NATO manufactured by United Defense Mfg Corp, Parañaque City, Philippines. It is shorter than the "infant" PDW but more powerful than any 9mm Sub-Machine Gun. Warranty is right HERE in the Philippines! LOOKS MAY BE THE SAME BUT QUALITY WILL NEVER BE THE SAME. SAFETY SHOULD ALWAYS BE THE TOP CONCERN. IF THERE IS NO WRITTEN WARRANTY BY MANUFACTURER, IT MUST BE DUBIOUS, SO BEWARE! For those of you who have UDMC units and who want the Philippine flag engraved on the right side of the lower receiver, we will do this for you Free-of-Charge. Let us be proud that UDMC is a 100% Filipino company, managed and operated by Filipinos and with no foreign consultants whatsoever. Time to be nationalistic. Mahalin natin ang ating sariling bandila! 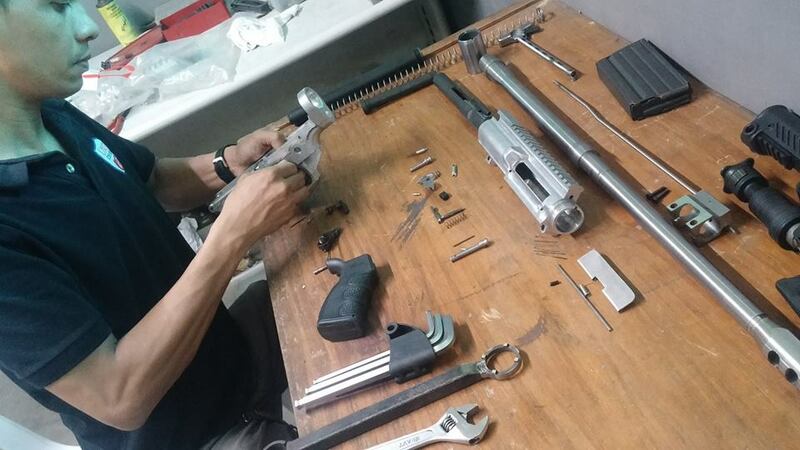 Every now and then, customers will bring to us their M16 and M4 rifles with stucked empty shells inside the chamber of their barrels. In some instances, the empty shells have ruptured at the base. In other instances, the empty shells got split in half and the front half gets stucked inside the chamber. Others would have dropped primers, etc. IGNORANCE CAN BE EMBARRASSING! CONFRONT THE FACTS BEFORE MAKING UNINFORMED STATEMENTS. The UDMC 1911 Officer's Model Pistol in caliber .45 single stack with a 3.5-inch bull barrel, double action spring, LaserAim sights on the rubber grip, Bomar tritium rear sights, fiber optic front sights and an overall dark matte nickel finish. Congratulations to UDMC Pistol Shooter Elvie Baldivino of the Philippine Team!! Gold Medalist in the Southeast Asian Games. WHAT DOES A SNIPER REALLY DO? ©2015 United Defense Manufacturing Corporation. All Rights Reserved.